OAL has helped a market-leading supplier of organic dairy products to secure their brand with packaging line automation, ensuring compliance with major UK retailers codes of practice. The system includes label and date code verification (Autocoding) and expanded paperless quality and factory performance modules that have reduced unplanned downtime. A well-known supplier of organic dairy products to major retailers. The customer was focused on protecting their positive brand reputation built on their organic status and fantastic quality products. After a significant investment in a sixteen lane yoghurt filling and packing line, the manufacturer needed to install a label and date code verification system to comply with retail codes of practice. Failure to comply can not only incur substantial monetary fines but can also have a detrimental effect on brand reputation and supply chain relationships. Following a review of suppliers, they chose OAL’s Autocoding system to protect their products and brand. The expandable OAL Connected system would also simplify their quality systems and management of their packaging lines whilst recording, analysing and displaying real-time downtime information. OAL’s Autocoding system comprised of an industrial touch screen unit installed close to the filler and four Cognex scanners positioned over the sixteen lines. Each of the scanners covered four lines. This adapted set-up guaranteed that every product was scanned and its image captured. 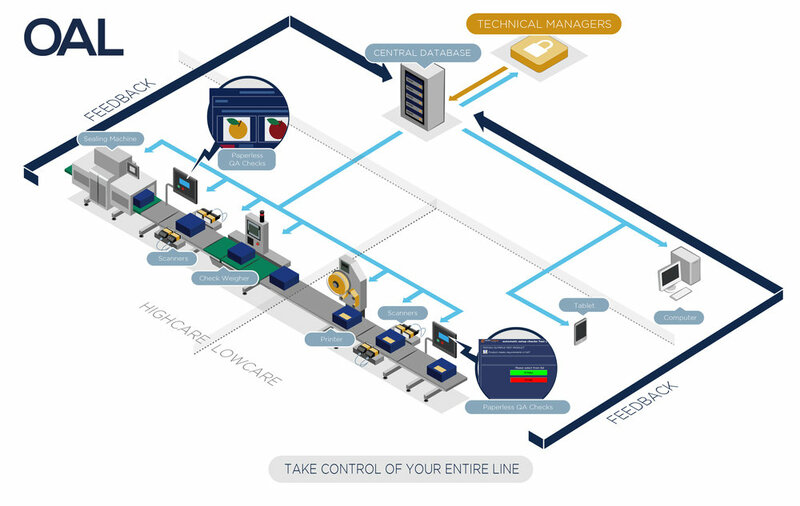 The OAL Connected solution includes the following highlights to drive quality assurance and operational performance on the packaging line. The installation of OAL Connected has enabled the site to pursue paperless QA and traceability to ensure packaging security and a full operator audit trail. The manufacturer can now make unlimited QA checks on their products automatically without the risk of inaccuracy caused by human error and loss / lack of paperwork. The automatic checks record accurate, real-time information to optimise productivity, quality and operator decision making and to reduce unplanned downtime. OAL installed four vision scanners each scanner covering four lines at once. Using vision rather than identity provided the flexibility required to run multiple products at once. Pre-production, the product’s profile is entered by an operator into the SQL database. When a product is scanned on the line, the data is pulled from the 2D barcode and compared to the information in the SQL database. If any mismatches occur, the line stops and senior management must intervene before production can commence. The accurate positioning of the scanners guarantees reliable label and date code verification system which eliminates the risk of product recalls due to label and date code errors. The OAL Autocoding system has prevented labelling and date code errors on the packaging line securing their brand from product recalls due to label and date code errors. Since installation, expanded performance and quality modules have meant that site has increased their productivity and reduced their unplanned downtime. The manufacturer can now run securely to the level of flexibility required to meet customer and retailer demands whilst maintaining their positive brand reputation in the dairy industry.